From the western side of the Cascade Mountains, we had traveled on Route 138 to Interstate 5. 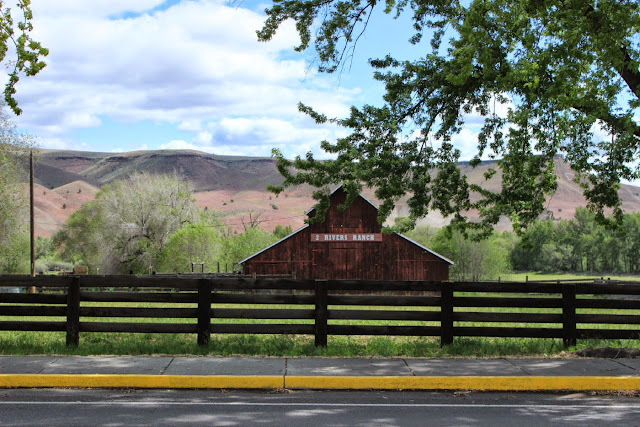 After a nice visit to Timber Valley Escapee park in Sutherlin, Oregon, we head north towards Eugene, Oregon. 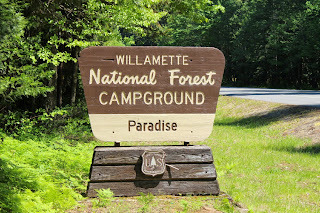 We stayed one night at a pleasant Corps of Engineer park, Schwarz,in Cottage Grove. 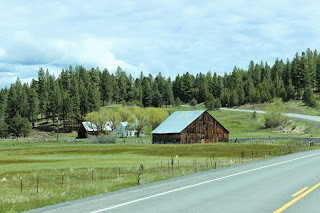 Then we headed east on Route 126. 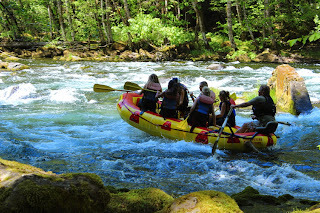 This takes us back into the Cascades and now the Willamette National Forest. This route follows the McKenzie River uphill. What a nice campground! Paradise is a good name with large , well separated sites. 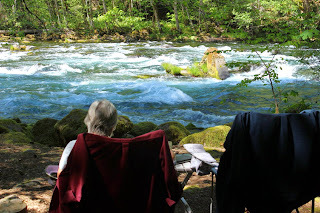 This is our site, right on the white water river. 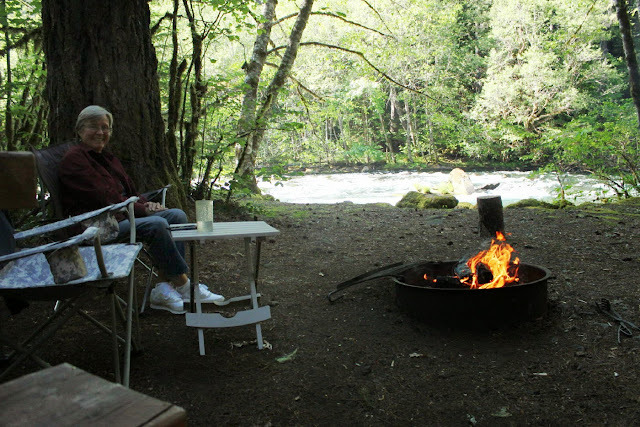 The moisture from the river has created a tropical feel in the campground with ferns, moss, and lots of greenery. Such a nice campground for Jan on Mother's Day. With some wonderful phone calls from family, a nice fire, and then a great steak dinner on the grill. 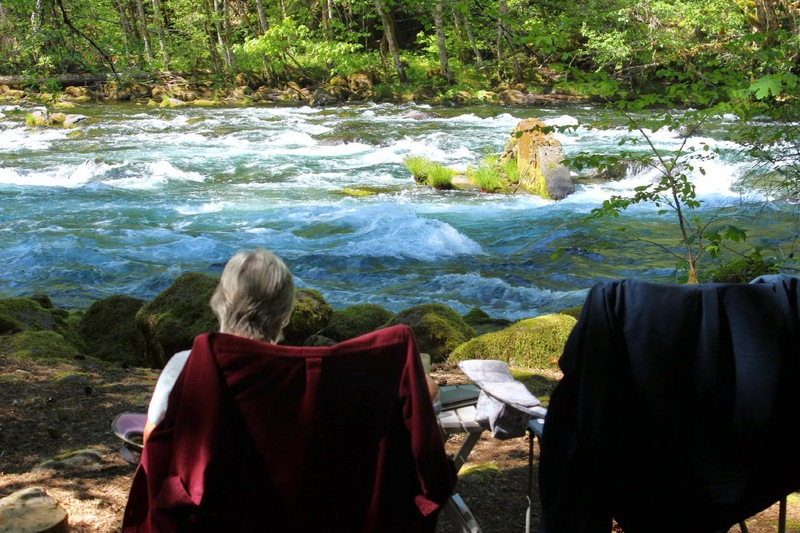 All this by the roaring(yes, roaring-----but in a nice way) river. 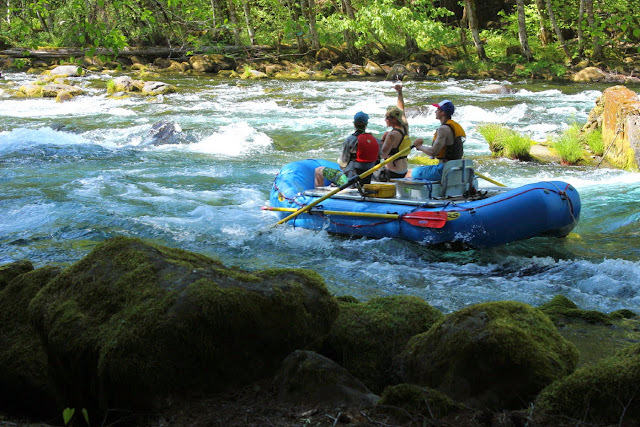 And then, surprise, a number of rafters, kayaks, and one row boat come rushing by. 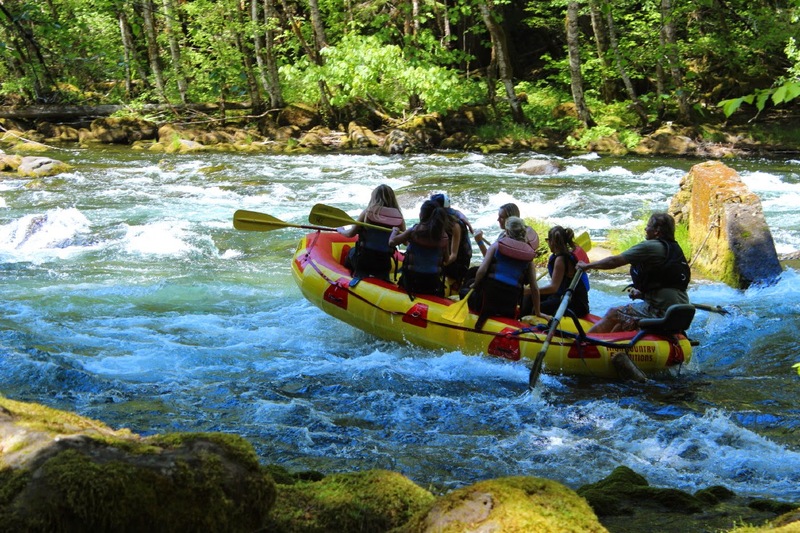 This was a raft from a rafting company. There was a lot of screaming as the rafts went by. This person was just finishing a wave to us. The rowboat that went by was about 14 foot, fairly wide, metal, and with a flat bottom. There were two people. One, in the bow, was fishing( don't know how that worked out--we didn't think the fish had time to even see or smell the lure)and one in the back was rowing like crazy to keep the boat from crashing into the rocks. The direct east route 242 is closed for the winter, so we leisurely do the loop of Route 126 north and east to Route 20. This takes us through the pretty town of Sisters and on to Redmond. 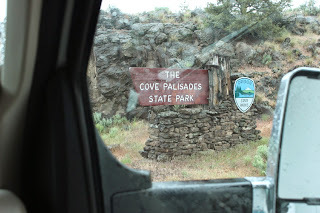 At Redmond, Jan and I decide to head north and see what the Cove Palisades State park is like. The park is on Lake Billy Chinook. 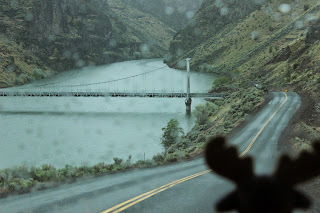 You see the lake on the way in, but not from the campground. 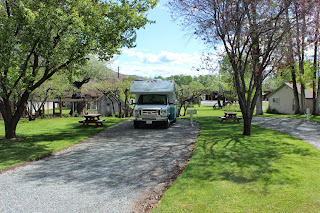 Still, a very well maintained, beautiful campground. The park surprises us. The road there is through some very flat farmland. 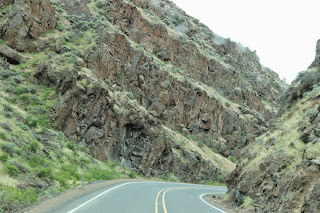 It seems like you pass by a farmer's field and all of a sudden, you are heading down into this deep rock canyon surrounding a large body of water. Eustis is keeping a keen eye on the turn for this very narrow bridge. 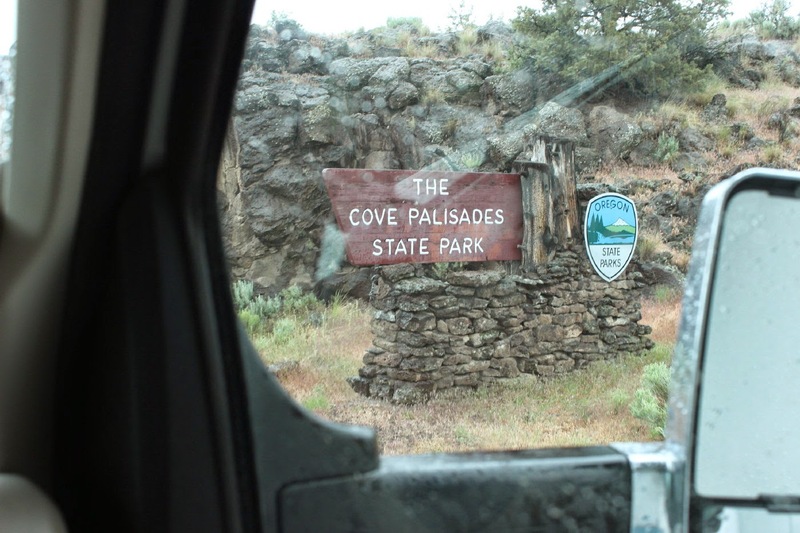 From the Palisades we travel north through the pleasant city of Madras and then south and east for a very scenic drive on Route 26. 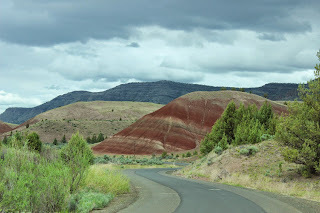 Along the way we detour into the Painted Hills Unit John Day Fossil Beds National Monument. Such a long name!! This home along the way shows the look of the high desert in this area. Eustis is happy to see one of many horses in the area. The next most popular animals are beef cattle and sheep. Oh, and one pig farm. Jan and I learn that this area is famous around the world for fossils of plants and animals from the post dinosaur ages of 55 million years ago to about 5 million years ago. 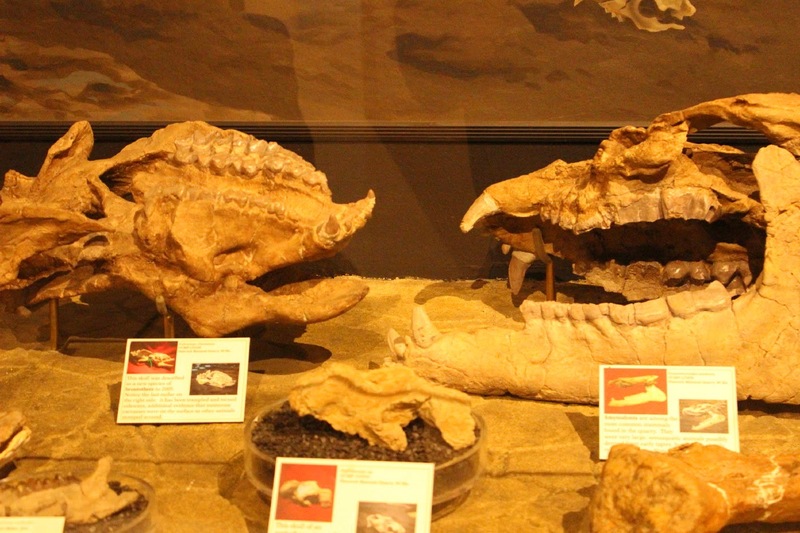 They have collected thousands of fossils and are still collecting. Millions of years ago, this was tropical. With changes in the earth's crust and many eruptions of volcanos, this area preserved many fossils in layers. 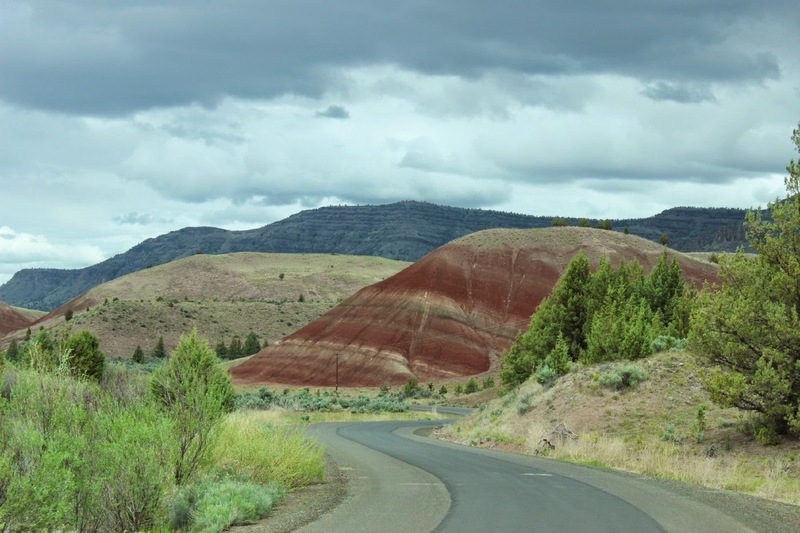 These hills show the layers of the different millions of years. At the visitors center is information on the house nearby that was built to be very, very,very green. 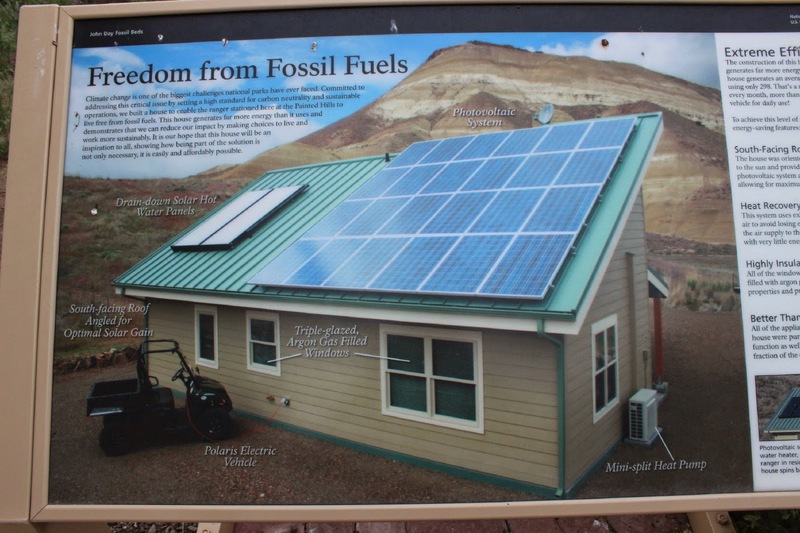 You see 24 solar panels on the roof. Also on the roof are two drain-down solar hot water panels.There is a heat recovery ventilation system( to preheat or cool incoming air with existing air),triple glazed, argon filled windows,extreme efficient appliances and lights, and mini split heat pump. 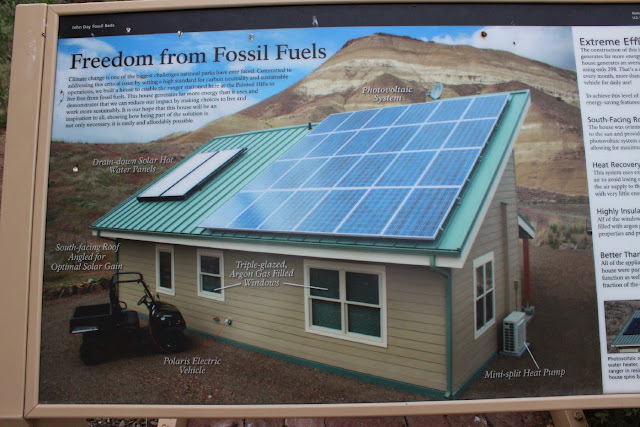 The house generated an average of 812 kilowatt hours and uses an average of only 298. There is a large, comfortable porch on the front. The hills show layers of black, yellow,white, and red. 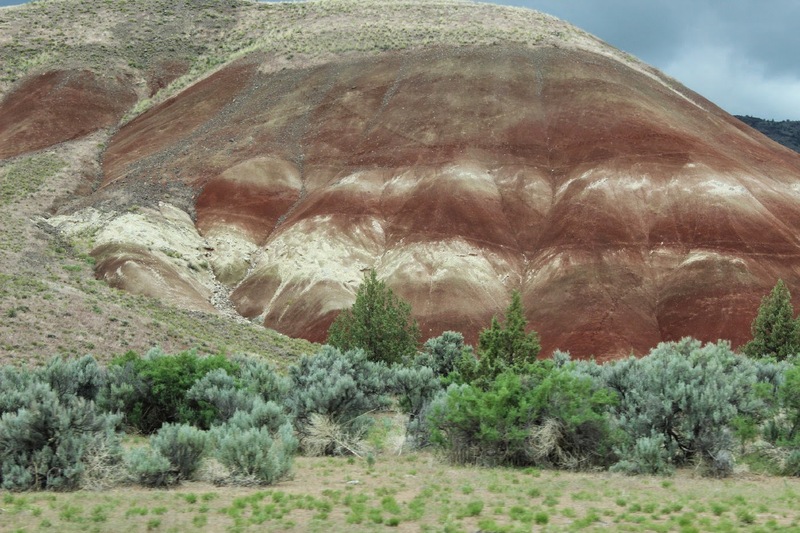 From the Painted Hills we head into Dayville. Following the John Day River, we pass through Picture Gorge on our way to a very small campground. In the center of this small town is the Fish House Inn and Rv Park. 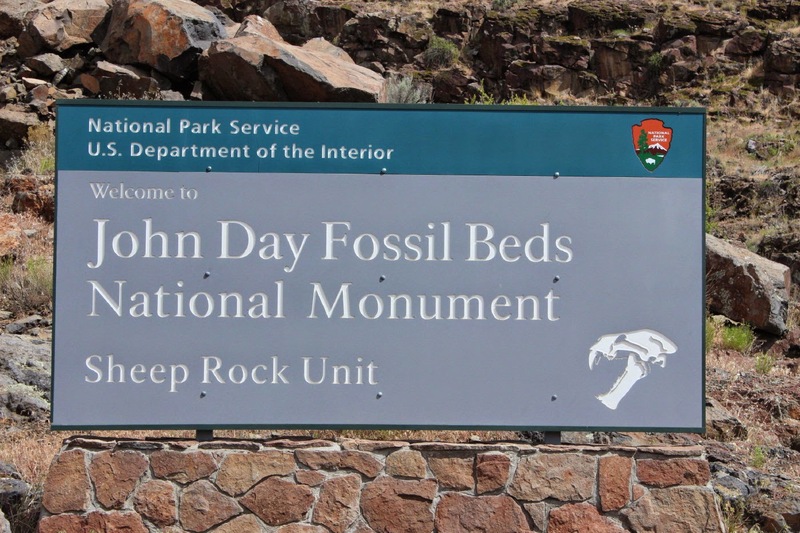 Only seven sites. But a picturesque, country club looking property. 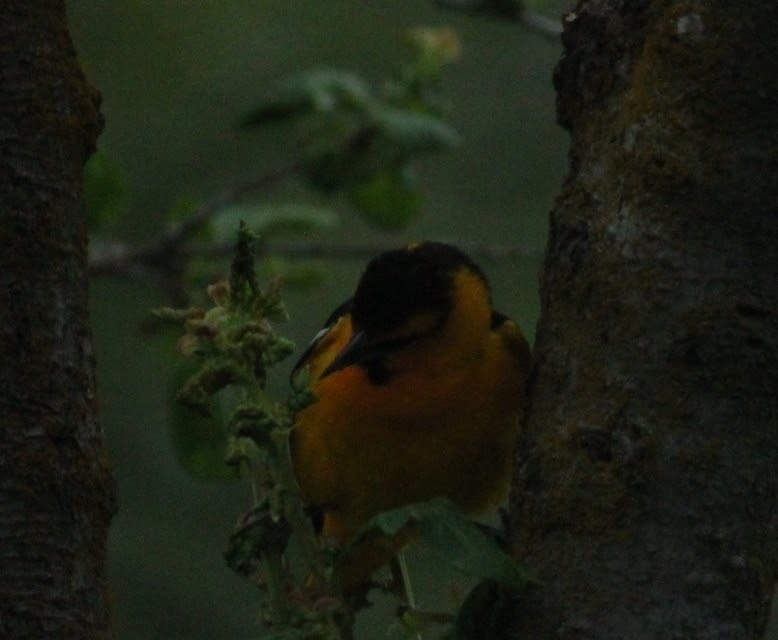 We also had some brightly colored warblers? behind Lady Blue. Sometimes, everyday barns look so nice along the main street. The next day Jan and I head a few miles back to the Sheep Rock Unit of John Day. 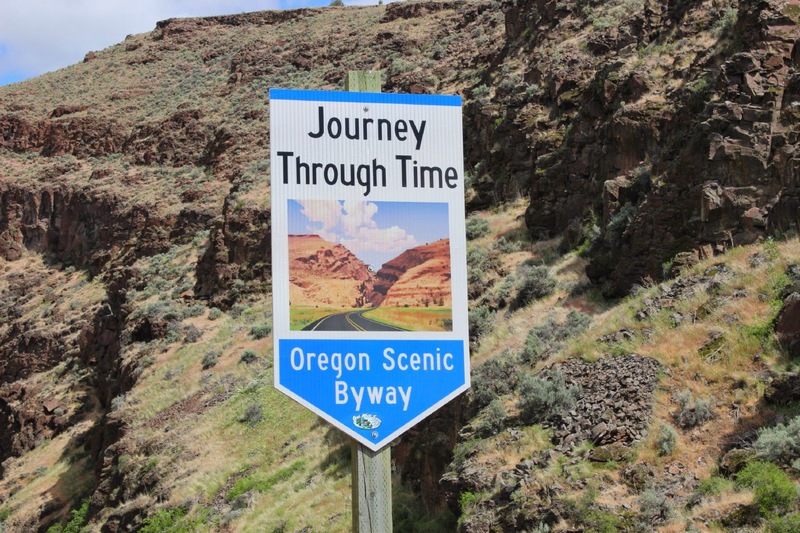 A nice touch are the Journey Through Time Oregon Scenic Byway signs. 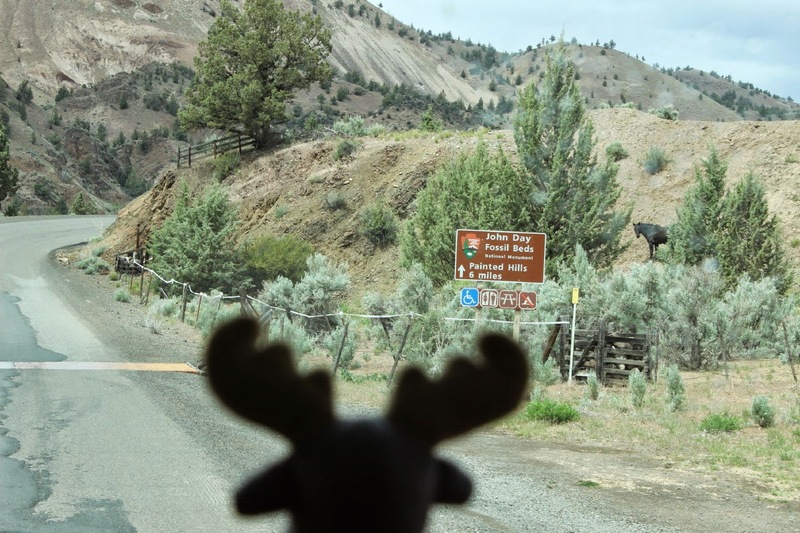 They are all along the fossil bed roads and also on the road to Baker City. 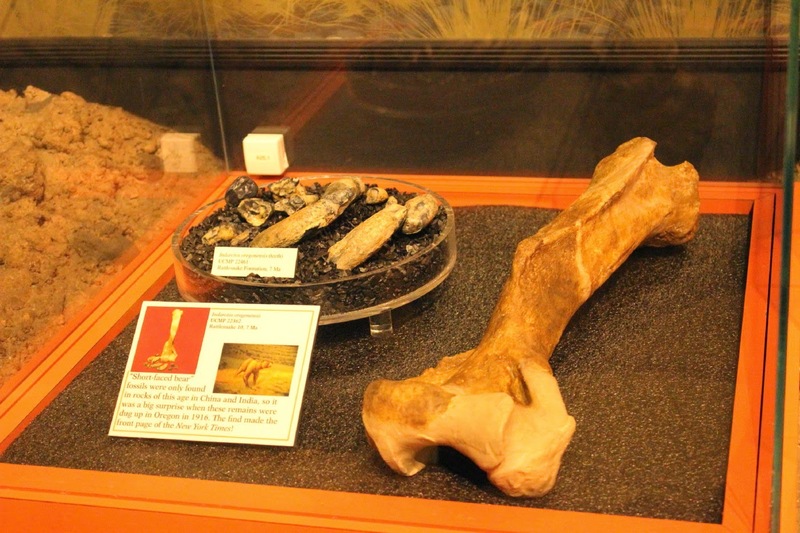 Near the entrance to this section is the large, modern Thomas Condon Paleontology Center Visitors Center. A beautiful, modern building that fits into the surrounding landscape. Also a green building. The displays are well presented with clear information for those of us who are not well versed in fossils. 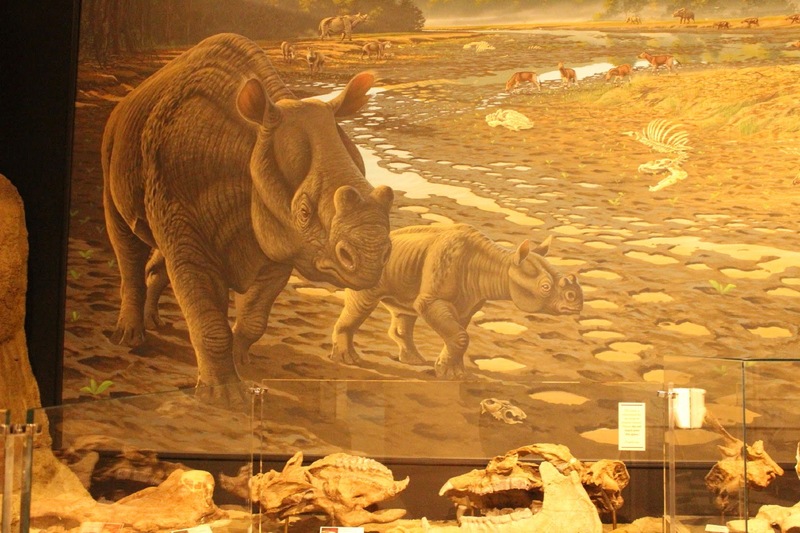 All kinds of examples of early hippos, horses, elephants, bugs, leaves, nuts, berries, and more. For some of us, it is always nice to see pictures of what the bones belonged to millions of years ago. While we were there, there was a group of about ten to twelve middle school children on a tour. They were led through by a well spoken park guide and had good worksheets which they filled out with enthusiasm. There were also some nice hikes through the area. This was part of the Blue Basin. Sometimes the colors are blue, sometimes more green. 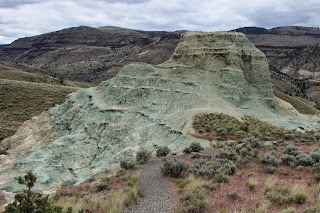 Following the Fossil Beds, it is a short trip to another nice state park, Clyde Holliday. 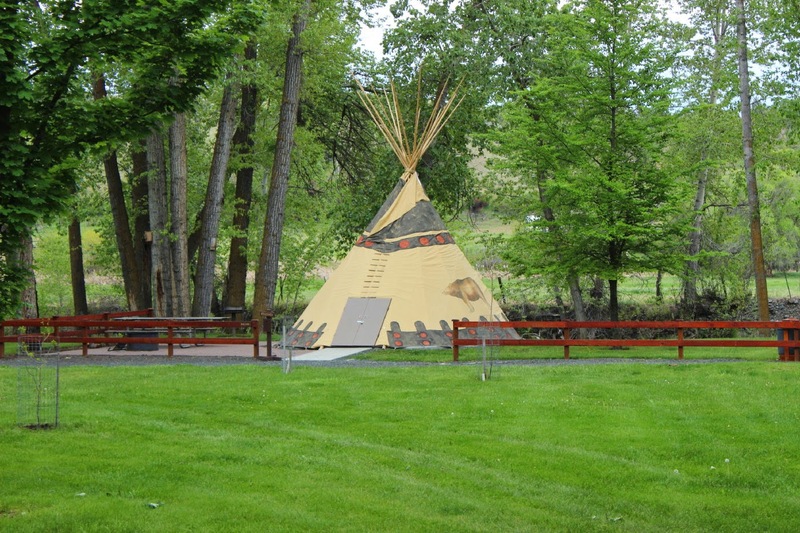 Again, it is well maintained, alongside the John Day River. 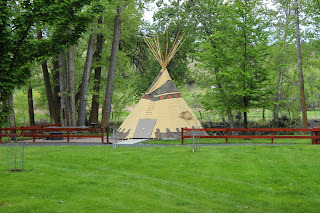 You could even stay in one of these teepees for the night. 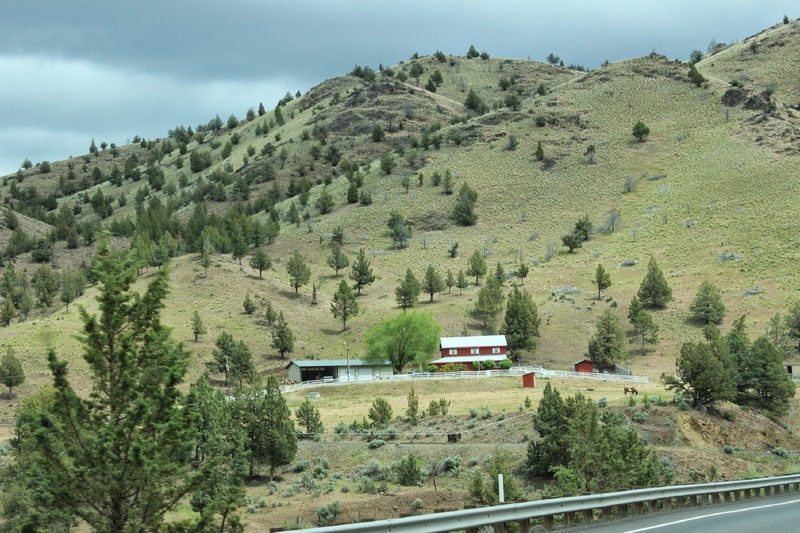 From the state park, it is a beautiful drive over the mountains to Baker City. We say "beautiful" a lot, but the views are spectacular. Again, very few cars on the road and not many houses or farms along the way. The mountains in the background here are the Strawberry Mountains. These are only a few of the many head of cattle along the way. Our Baker City host indicated that the locals really enjoy their locally raised beef. Just be sure you have an economical , probably 4 wheel drive vehicle. Everything is a long drive. 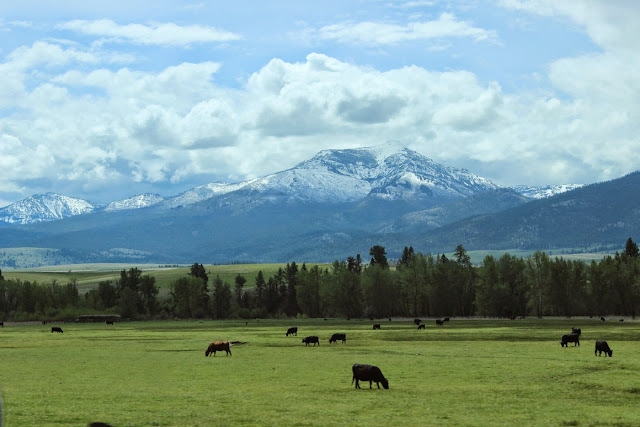 This is another view of the Strawberry Mountain range. This is from atop the hill going east out of Prairie City. What a country!!! !